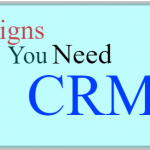 Cirrus Insight has made The Better List! The Better Partners team built The Better List to help you find the best possible tools for your business, while on a budget. Therefore, our tech geeks did the research for you. 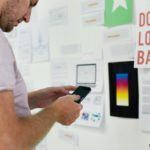 We’ve based our recommendations on six parameters based on capability, cost, and customer service (check out this blog to get the full scoop on The Better List). 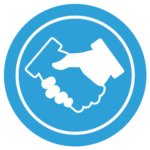 The Better Partners team uses Cirrus Insight daily for email integration and email tracking with Salesforce. First, we’ve found that it effectively keeps track of the massive amount of email that’s used to conduct business today. Hence, it made The Better List. Normally, it’s cumbersome to capture all of the threads of information coming in thought email. And, it requires double data-entry to get that information into a Salesforce record, which may be a barrier for your team to adopt good data practices. 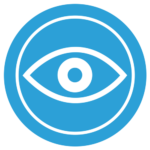 This tool keeps track of everything communicated via email.With the click of a button, you can search and select where within Salesforce you want to attach the email. You don’t even need to leave your email platform! In addition, valuable Salesforce data appears next to every email you open, right in your inbox (both Gmail and Outlook platforms are supported). If you’d like to see how it stacks up to our six Better List criteria, read on. 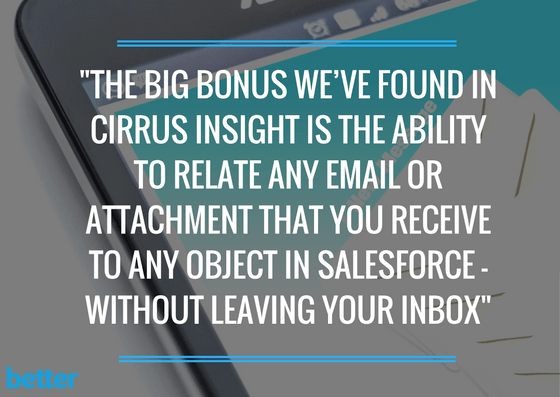 Our favorite Cirrus Insight feature is the ability to relate any email or attachment that you receive to any object in Salesforce without leaving your inbox. For example, if you receive an email from a new prospect, you can create a new company in Salesforce without ever leaving your inbox. Additionally, it will grab the contact information listed in the footer of the email to save you time on data entry. And, future emails from the prospect can be attached to your communication file as well. Our team can help you configure your Salesforce system for to optimize this feature. Another perk is that the integration of Cirrus Insight with Google Drive is crazy good. We also love that we can take advantage of user enhancements, especially related to our calendar and scheduling. This makes it a great productivity tool and one you should consider. 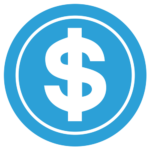 When it comes to pricing, the tool is on par with other email integrations on the market. 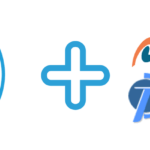 There is a tiered pricing plan for multiple levels of functionality, and the base package starts at $19/user per month.Better Partners is a referral partner of Cirrus Insight and can offer our customers a 20% discount. Additionally, non-profits can expect to receive a 50% discount. The company offers a 14-day free trial, no credit card required. 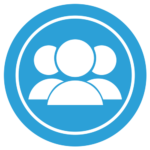 Each Cirrus Insight user requires their own license (see their tiered pricing plan for pricing per user). Although there’s no formal community, they’ve integrated a knowledge base into their website. Therefore, users can search support topics to find answers based on other users’ questions. We’ve experienced stellar customer support from Cirrus Insight. 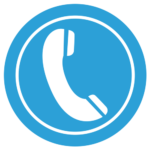 Most noteworthy, you can submit a request from within the app (as well as by phone or email). Either way, the rapid response is impressive. They company shows a genuine interest in what customers want, as well. There’s even a system set up to submit new feature requests! 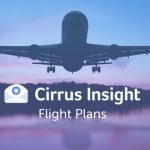 Is Cirrus Insight Right For You? If you depend heavily on email to for sales, customer communication, and project management, this tool might be for you. It’s the smoothest Salesforce email integration tool we’ve found; not only do our clients love it, so do we. 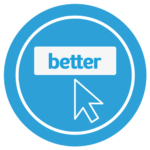 If you’d like to learn more about how it could increase productivity and help your team save time, connect with our team at Better Partners. And, to learn about more of our favorite process and productivity tools, check out The Better List.